With the experience the Arcade-a-tron MkI and MkII from years ago, I finally set about building a new arcade cab with a much higher quality finish. The first thing I thought about was the screen. I was very tempted to use a spare 51cm TV, I like the authenticity of ye crusty ole' CRT but don't like the issues that come with them; the main problems are bulk, age and connectivity. 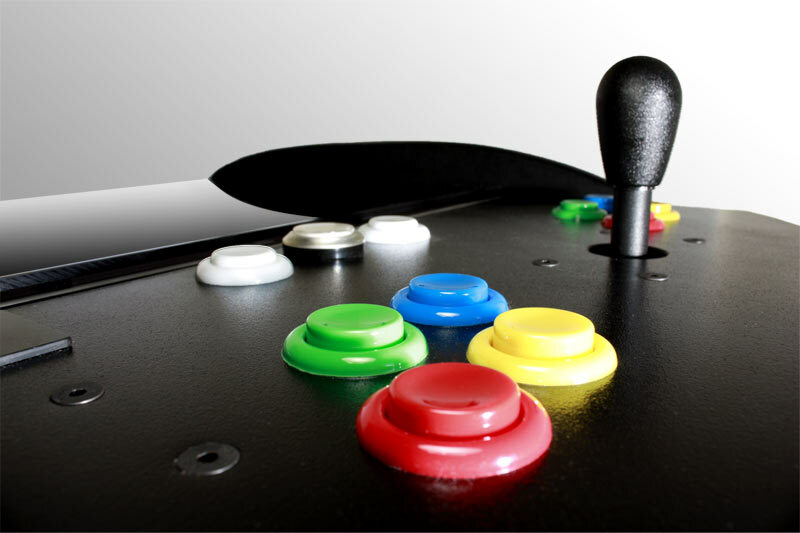 There are plenty of guides talking about the merits of CRTs vs LCDs in arcade cab's so browse around and make your own mind up. 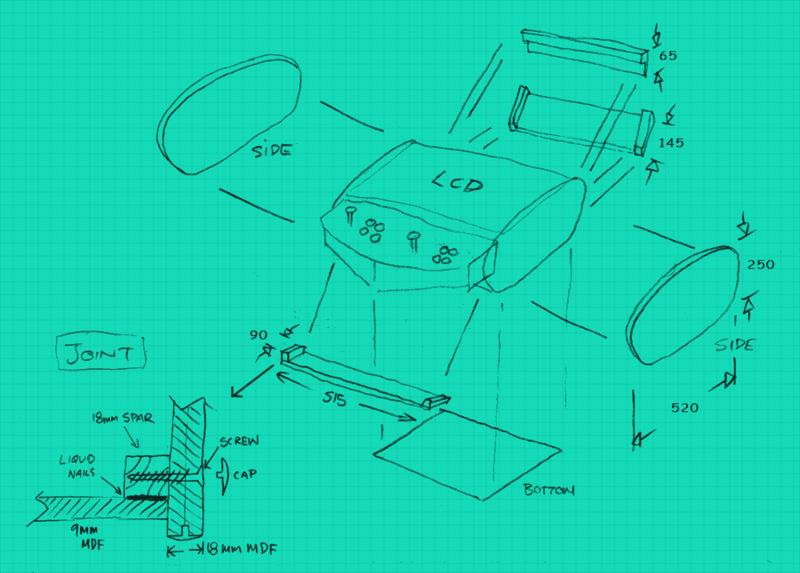 In theory the design that follows could be adapted to a CRT with a bit of modding. I also had a spare 22" LCD sitting around. When I weighed up the two options the LCD won out on size, looks and ease of use. It does have one major flaw compared to CRT and that is the crappy viewing angle. This means I couldn't create the standard flat table-top (cocktail) cabinet I had in mind, with the player viewing the screen from a 45° angle. If I wanted a cocktail cab' I'd have to get creative with some sort of screen angle adjustment mechanism. So with the screen all but decided, I can take some dimensions from it and start to get an idea of the cabinet's overall size. One important stipulation learnt from my earlier experiments was to keep the thing as small as possible while still retaining a fairly authentic arcade feel. 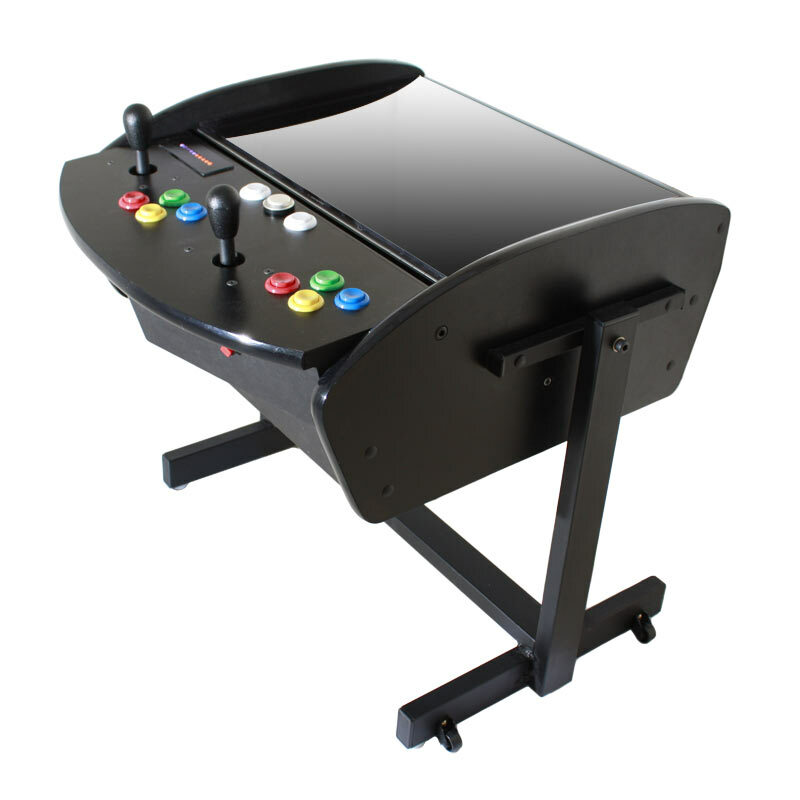 The lowboy style of cabinet would've been a good fit for LCD (and its viewing angle issues) but way too bulky for my needs. So I had to think about getting the good points of a lowboy design into the compact form of a cocktail cabinet? After a lot of sketching I eventually came up with a fairly compact design that allows quite a bit of flexibility in the position of screen and controls as well as player seating position. Basically, it's sort of a sit-down lowboy. 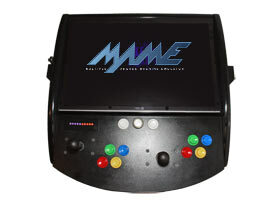 The screen angle is adjustable by pivoting the whole cab' on the support legs, the angle of the controls relative to the screen is adjustable using a lever on the side. 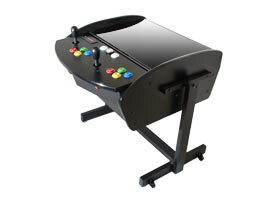 The level of adjustment needed depends on the player's seating height and viewing angle. It works pretty well, is quite compact and can be stored either in the flat or upright position. So, the first thing to note are the screen dimensions; the screen I used is an Asus VW222u which is: W515mm x H340mm x D65mm. The display's width determines the cabinets width. For me this works out to be 515mm plus the thickness of the two side panels (18mm each), for a total of roughly 551 plus a few mm, say 555mm. The next question is, can I fit controls for two players into 515mm? I have a control panel from an old arcade machine I bought years ago which measures W530mm across (with a lot of wasted space to the sides) so, at a glance it should all fit. To pin this down, I though about button layout in some detail. Most games don't need more than three buttons, I put in four to be safe. 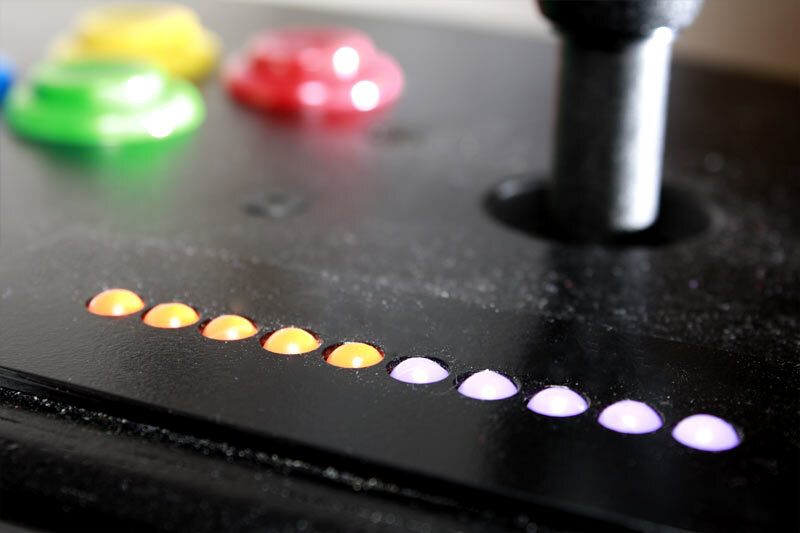 if you're a fan of 6-button games you can probably squeeze two more in. I wanted to make the controls look nice and have a curved front edge so the height gets a bit more added on for that feature. 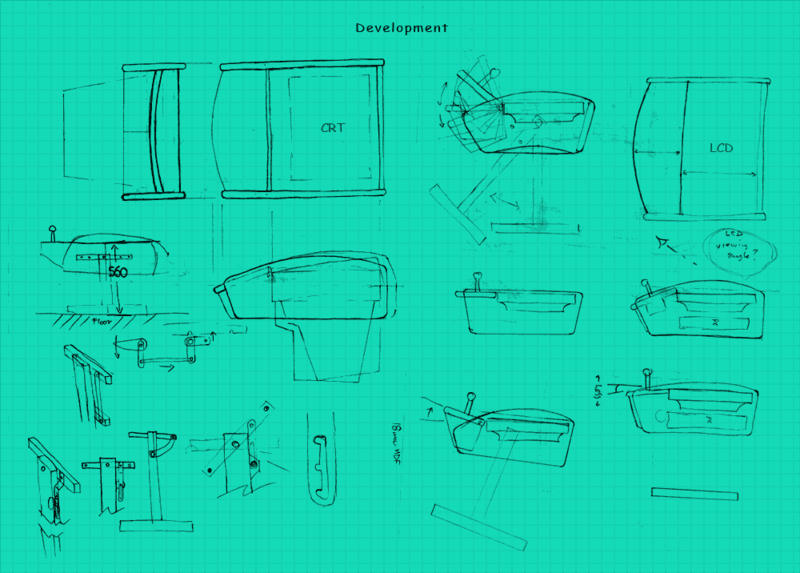 Next, I sketched some plans for the other major bits; the PC mainboard, HDD, DVD(optional) PSU. Fitting all this in determines the cabinet depth 250mm. 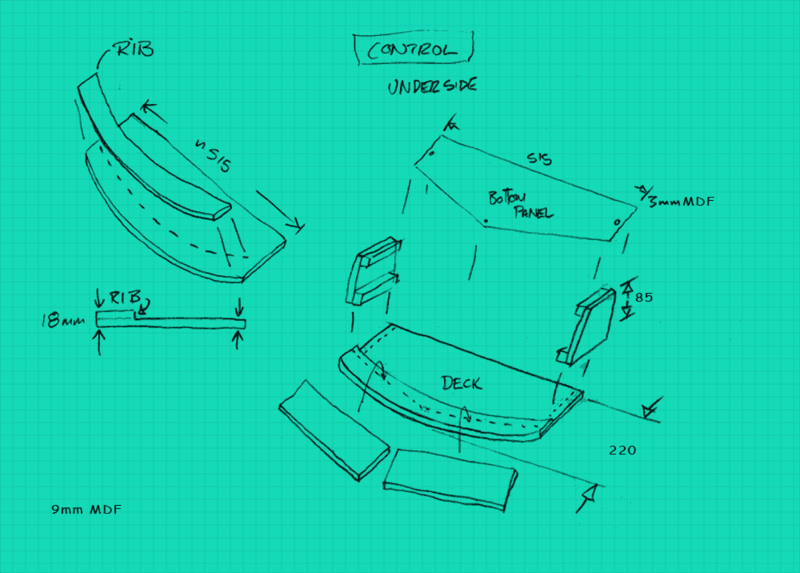 Now I'm happy all the bits will fit in, I drew up some profiles for the side panels. 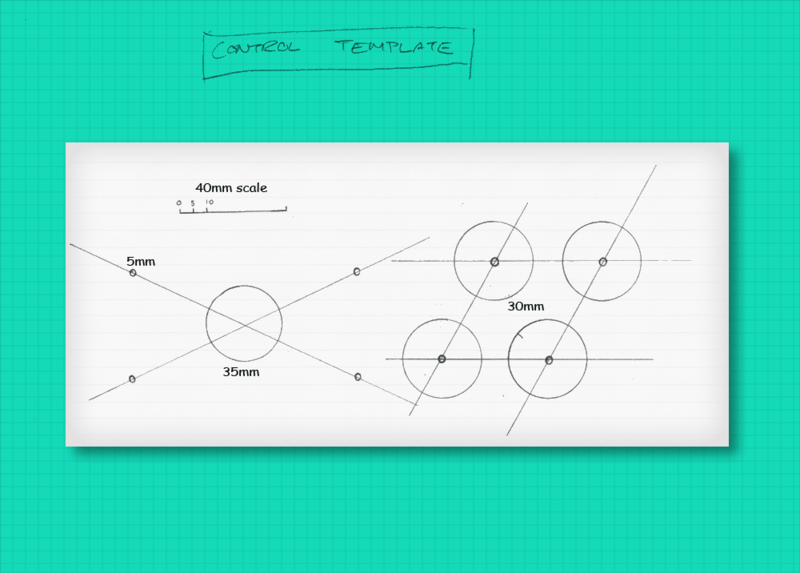 I wanted these to be curved forms so the T-moulding can run around in a continuous strip. 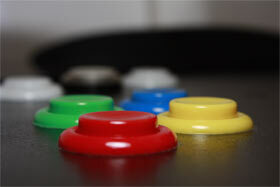 I eventually settled on a nice shape that was sympathetic to the curved front of the control panel. The T-moulding is designed to fit 18mm panel, here I ran into a bit of trouble as the hardware shop only stocks 18mm MDF in large 2400 x 3200 sheets, I don't need that much! Instead I bought a 600x1800x9mm sheet and laminated two sections for each side panel. It's a bit of extra work but means I can use 18mm in the places I want, and build the rest with 9mm. The next part is pretty straightforward, creating small panels to box out the cabinet. The LCD and control panel occupies most of the top face, the rest is spanned by narrow sections. 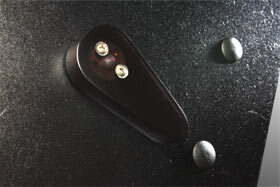 The bottom panel is a thin piece of 3mm that is removable. see: Figure 1. My joinery method is fairly simple, using cut pieces of 18mm square spar glued to each spanning section and screwed to the side panels. see lower left: Figure 1. Now we have a basic boxform, the control panel can get boxed in also. This was a little more complicated as I was trying to get clever with the form. The deck has a curve with T-moulding running along the front edge. Building a box on the underside requires a bit of shape-and-fit trial and error. This is all glued together with liquid nails. There is a bottom panel that is held in place with 3 screws. see: Figure 2. The next step is to attach the controls to the cabinet. 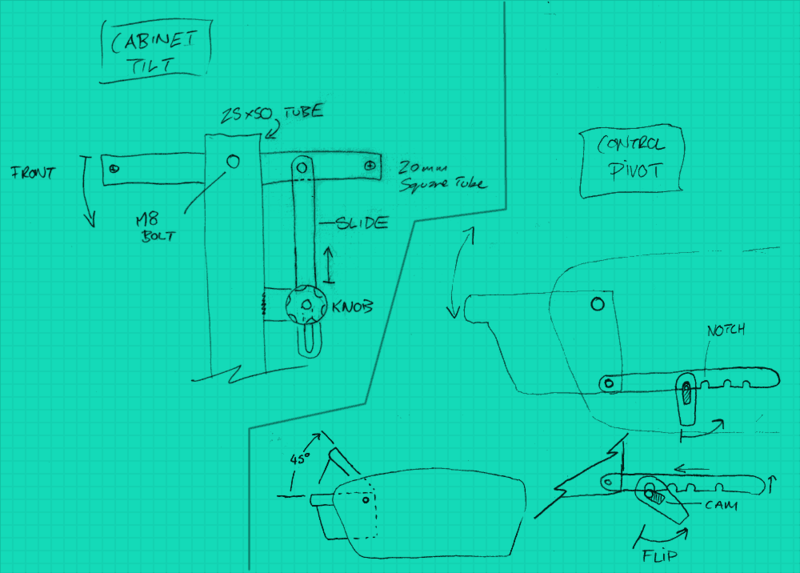 This will be a hinged joint so the angle of the controls relative to the screen can be adjustable. I used a couple of 8mm socket head bolts as the hinge, these are counter sunk into the side panels and threaded into the control box. The angle adjuster is a little tricky and I suggest you come up with your own method if it's better than mine. 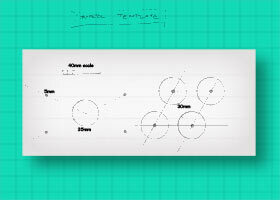 Here's a sketch of the basic principle. Figure 3 (right). Really the only thing remaining besides cutting holes for buttons is to fabricate a stand and fit out the innards. I had some scrap 1.2mm wall 25x50mm rectangular tube which I welded up into a stand. It's very simple just an inverted "T" on each side connected by a cross member. 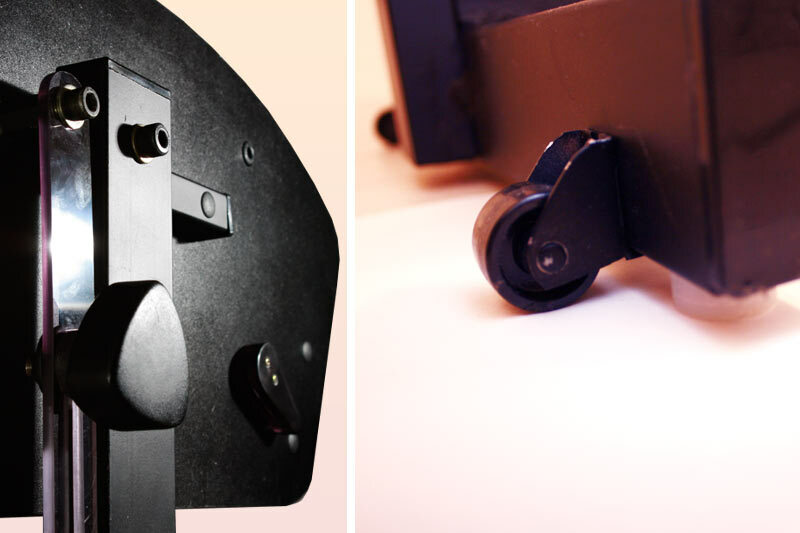 The cabinet tilt adjuster is described in Figure 3 (left). It allows screen to be tilted up to 45°. Locating all the parts inside depends on what parts you use, a standard ATX mainboard, PSU, Hard Disk and DVD drive will fit with plenty of room for additional fans etc. I used the guts from sidewinder joypads as my control boards and a keyboard encoder chip for misc' keys such as ESC, required by some emulators but you could just as well have a wireless keyboard handy. I mounted the LCD using a cross brace and bolted it to the VESA mounts on the back, the mainboard was also attached to this cross brace on the underside. Some finishing touches are a piece of 6mm tinted acrylic protecting the screen, black T-moulding, some little wheels on one leg to help move it around, end caps for all the tubing and caps for all the screw heads. I painted the MDF with acrylic ink instead of spray-paint. It's water-based and soaks into the MDF surface instead of coating it so it wont chip off and doesn't stink as much, it also has a nice ultra-matt finish. For increased durability in places I gave the surface a spray of gloss clear acrylic. Excluding the LCD monitor the total material costs for this project were less than AUD$200. Controls; buttons and keyboard hotkeys. Cabinet tilt adjuster and wheels. 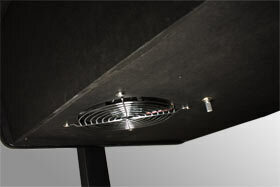 120mm exhaust fan with speed control. Control deck tilt release lever and a nice shot of buttons. See: Emulation for more photos of this project. On the software side JoyMouse is quite handy if you don't want to have a real mouse on constant standby. XP's built in onscreen keyboard can be useful in some cases too. Setting up emulators can take a while and is best done with a real keyboard and mouse. Oddly, I had some trouble getting my monitor to display at its native resolution (1680x1050) using VGA. I had to connect it using DVI, then it "remembered" how to display using VGA, weird? I recommend using DVI if you've got it. Some people like to simulate the fuzziness of arcade monitors by running their screens off-native, it's up to you. Many emulators have some sort of CRT-effect simulation such as scan lines or pixel grids, some of these effects can look pretty good on an LCD if your not too fussy, if you are stick with a CRT. 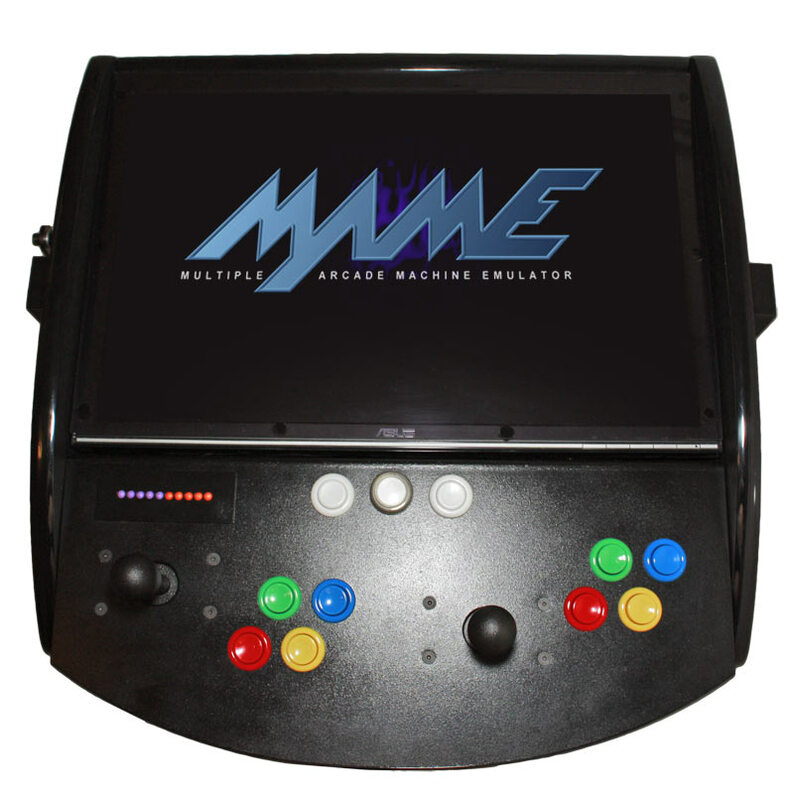 I don't know much about the various emulator frontends/skins that completely hide the OS but I might look into these to enhance the retro arcade cab' -not a computer- feel.